Turbo Folk is a blackly comic three-hander taking a sharp look at Scottish nationality at home and abroad. 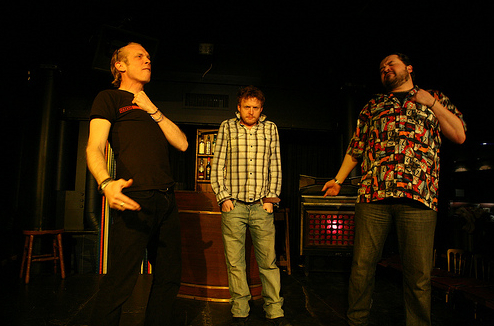 Set in the sort of bar you wouldn’t take tourists to, in an unspecified Balkan country, Turbo Folk’s “dazzling linguistic games” (The Scotsman) earned Alan a nomination for Best New Play at the 2010 Critics’ Awards for Theatre in Scotland (CATS). This play was first performed at Oran Mor, Glasgow, in April 2010, starring Steven McNicoll, Simon Donaldson and Ryan Fletcher. Directed by Sacha Kyle. “…it’s a blazing relief to turn to a 40-minute, three-handed show that focuses fiercely on a single aspect of Scotland’s myth-making about itself, tells its story with pace and economy and delivers a real and frightening dramatic punch. 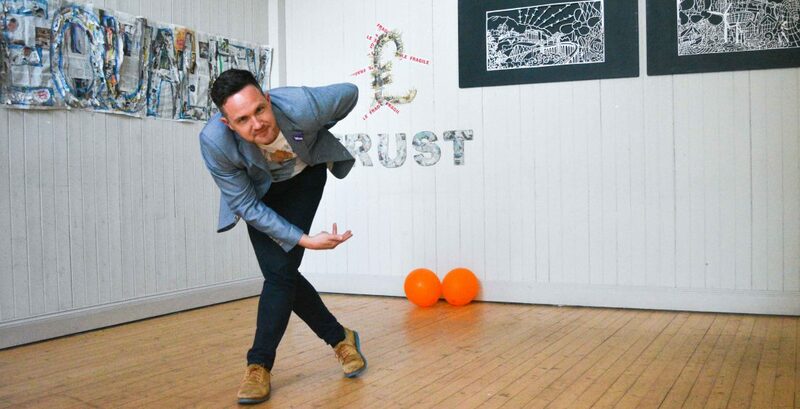 This week’s Play, Pie and Pint lunchtime show, written by rising star Alan Bissett, is the short and brilliant tale of a doomed visit by a touring Scottish singer/songwriter to a whisky bar in some Balkan town still riven by memories of war. In the great tradition of naive Scots abroad, the guileless Cameron – brilliantly played by Ryan Fletcher – thinks everyone abroad loves the Scots and hates the English; but to his minder Miko and heavyweight barman Vlad (Simon Donaldson and Steven McNicoll, both in magnificent form) he is just another Brit, blood brother of the “peacekeeping” soldiers who recently occupied, patronised and brutalised their country.